Even though the last original Gears of War released in 2013, it was a long wait for Gears fans to see a new iteration of the series. While we received the Ultimate Edition of the first title last year to quench our thirst, we still hadn’t seen a next gen game in the series up until that point. Now finally we get to build further upon the story of the third game, which originally was promised to be the ending, but sometimes you just need to continue the story, not only to make the fans happy, but simply because there’s still a lot to tell. Twentyfive years after the third installment, we also get to follow a Fenix in a rather epic battle, albeit Marcus’ son, J.D. It has been twenty-five years since the Locust and Lambent have been wiped off the face of the Earth, but in doing so the planet itself has also suffered. Fossil fuels have been rendered useless, and thus humanity clings to other ways in order to properly survive. The remnants of humanity have been divided into two factions, namely those who are loyal to the COG and those deemed Outsiders. The COG is building walled cities in order for the general populace to survive, as the world has taken a heaving beating when wiping out the scourge that infested the planet. Currently pestering the world are ‘windflares’, which are comparable with hurricanes that carry a truckload of lightning inside of them. In this setting you’ll take control over J.D., who clearly shows nearly the same features as Marcus Fenix, albeit younger and slightly softer when it comes to his personality. You were once part of the COG, but went rogue afterwards, and are now helping Outsiders build up their encampments. You are accompanied by Del and Kait, the first being your childhood friend and fellow COG deserter, the latter clearly being your ‘special friend’ and raised as an Outsider. You are trying to raid an encampment under construction to steal a ‘Fabricator’, a device capable of building entire cities, simply to get power to the Outsider encampment you’re staying at. Nonetheless, while the initial raid goes fairly well, things in the camp go awry, when suddenly weird monster-like creatures show up, slaughter the inhabitants and kidnap Cait’s mom, all while she had trapped the trio of younglings inside to remain safe. Determined to find her, they head out to find help. 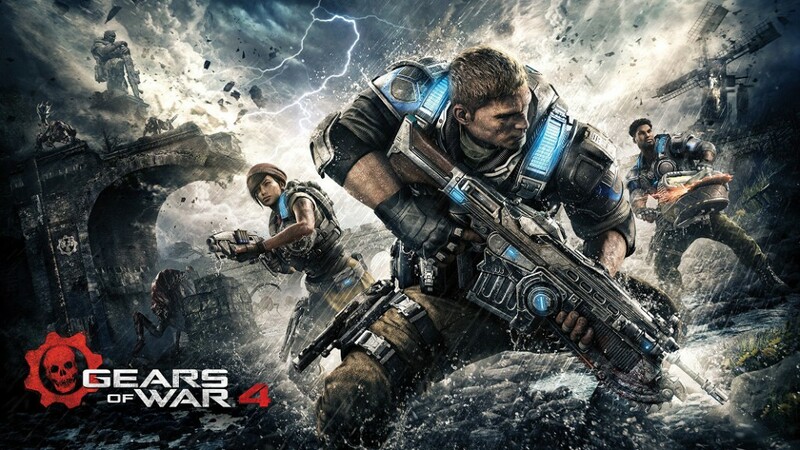 Overall, just like the first Gears of War, the story is emotional when it needs to be, funny when you desperately want it to be and action packed. Nonetheless, even though the overall plot is interesting, it isn’t really that thick, which was also a thing in the first trilogy, where the first part didn’t give you that much information to work with, while slowly elaborating on the matter in the sequels. We hope this will be the same for the next set of games. 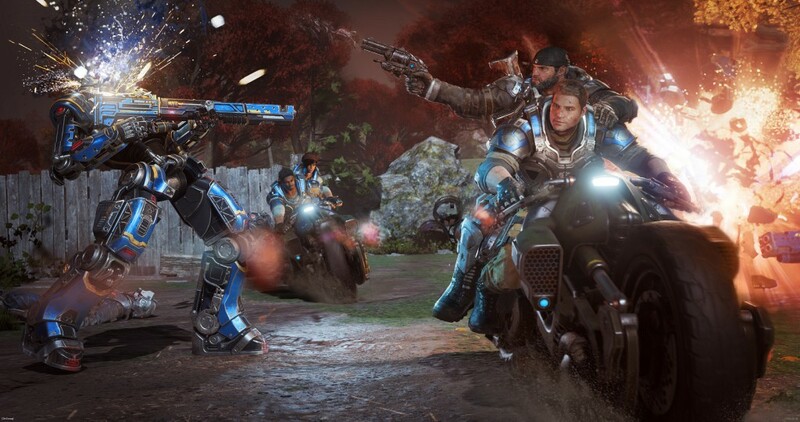 In many ways Gears of War 4 is very similar to the previous games, except that this one might have a more cheerful appearance than the previous iterations. This title also has a more cinematic feel to it, making the adventure that much more ‘epic’. Overall things are chock-full with details, and pretty much everything looks realistic, even in this rather unrealistic setting. Hints of retro technology in combination with the very modern robots make a beautiful whole. As just mentioned above, Gears of War 4 has a theatrical feel to it, this is mainly due to the environments, the amazingly detailed action sequences but above all, the cutscenes that are more frequent in this title. Where the previous games fed you more story content in the middle of your missions, simply by feeding info through the radio or with the use of conversation, the current cutscenes depict more events. These short scenes are graphically more qualitative than the normal gameplay, but they overlap seamlessly, again creating and maintaining a beautiful balance. This is another facet in which the Gears of War series has never been a disappointment. Even while the music plays in the background, the overall soundtrack gets you riled up enough to blast away your enemies, and there’s a subtle and calm song embedded when the situation calls for it. Players who have been longtime fans will also notice a familiar sound at the end of combat, as the game pretty much warns you with a one second SFX that all enemies in the vicinity are gone. All of that being said, it’s easy to say that the voice acting steals the show in this series, as most of the story content is presented to you via conversations with the other characters, which allows you to get to know your compatriots as well as what is going on. The voices actors are Hollywood worthy and thus make the entire grim experience feel realistic. 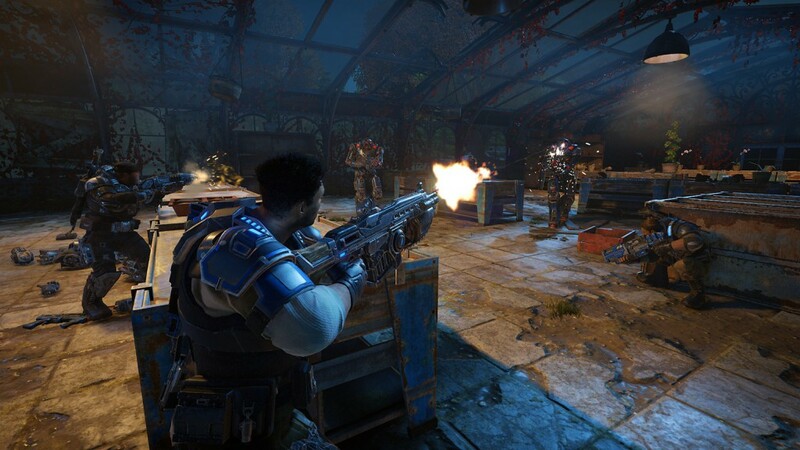 Gears of War 4, just like its predecessors, is a cover based third person shooter, with some tactical elements thrown in the mix. While on the easy settings you can pretty much enjoy the story without that much resistance from the enemy troops, you will also notice that you can’t simply run into battle headfirst. Cover is, and will always be, an important factor in Gears of War, but outside of that, you’ll be running, gunning and operating the occasional fancy vehicle to add a bit of variation to the mix. The campaign is pretty straightforward, be it on your own, or with a friend while playing split-screen, as you’ll be following a predetermined path to your objective, with a few minor sidetracks allowing you to explore a bit and find a collectible item hither and thither. You’ll have to stick to a loadout of a rather realistic proportion, namely one pistol-like weapon, two heavier weapons and a few grenades. You can switch weapons freely by reequipping new ones you find on the map, while ammo is also littered around the world. If you’re lucky enough, you can add another weapon to your arsenal, that is dropped by heavy units, but it will also be discarded when you run out of ammo. Overall combat becomes more enjoyable in this game thanks to the cover and reloading mechanics. The latter being more than simply pressing the reload button alone, as you’ll also have to properly time your reload to make it go faster, or slower in case your timing is off. This makes even reloading an active part of the game. As expected, the game also has sufficient multiplayer features to plow through if you’re one for competitive or cooperative play. You’ll have a decent amount of versus options to choose from, but personally we tend to spend a lot of time in the Horde mode, in which you have to choose between a fixed amount of character classes to fend off wave after wave of monsters. 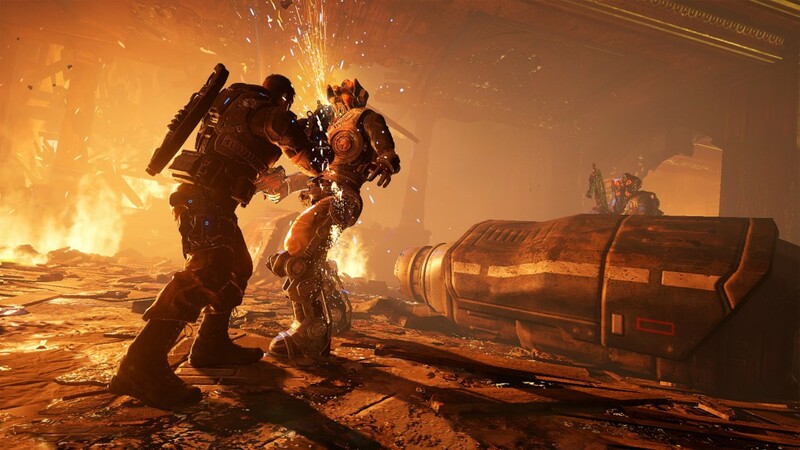 The latter is certainly advised to be played with as many as possible, but seeing Gears of War 4 only allows you to play it online, it should not be an issue. Gears of War is actually one of those franchises that pretty much thrives by the use of simplistic mechanics, albeit perfectly honed ones. You’ll notice that this is a shooter which you’ll get the hang of in mere moments, as many actions flow fluently in one another. The cover based system is nearly perfect, the combat mechanics are simple yet effective, and all the weapons are ‘user friendly’, making sure you can enjoy every aspect of the game equally. Since the first game, Microsoft has stuck with the same mechanics, and we can only applaud them for it. Perhaps only one remark goes to the fact that many of the enemies feel and look similar to those of the first ‘trilogy’. While this creates a familiar environment, it also feels like there could have been a bit more diversity. 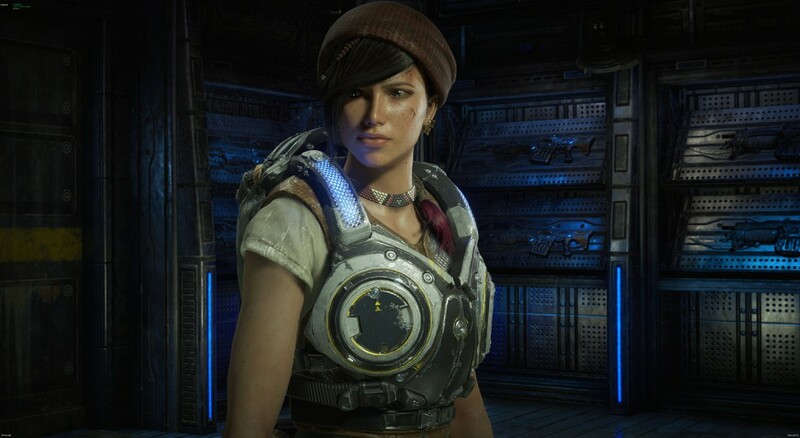 Gears of War 4 is one of those examples of a franchise still running strong, even with the new(er) setting in place, and different characters in the lead, albeit ones that still feel very familiar. Indulge yourselves with an interesting campaign, with the necessary triumph and sob moments, and afterwards dig in with the multiplayer features, which received a new lick of paint. Fans of the series, and newcomers alike will certainly enjoy this Microsoft exclusive title that was more than worth the wait.